Today, we are excited to release The Salesforce.org 2018 Social Impact Report. Social sector organizations exist for a singular purpose, their mission. Salesforce.org is no different. 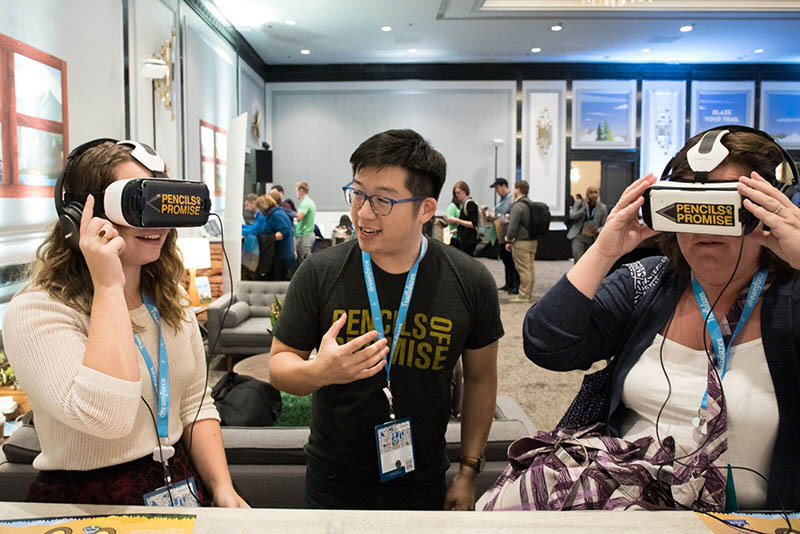 The report celebrates the strides that Salesforce.org stakeholders – our technology trailblazers, our grantees, and our citizen philanthropists – are making to advance social impact. Working with our stakeholders, we’ve identified preliminary outcomes across our primary portfolios: Technology, Investment in Future Ready Leaders, and Community Engagement. This report is a milestone in how we think about impact measurement and engagement. We’ve been inspired by listening to our community of customers, grantees, and employees who volunteer with and donate to causes they care about. We understand that to accurately report on our social impact, we must focus our attention on outcomes, how our beneficiaries change because of the work we do. This report represents our efforts to move beyond the numbers to understand and measure the impact of our work in the community. Working with our stakeholders, we’ve identified preliminary outcomes across our primary portfolios: Technology, Investment in Future Ready leaders, and Community Engagement. Overall, we are excited that we’re providing more than $1B in social sector value, according to McPherson Strategies. Our Technology outcomes focus on improving the capacity of the social sector by providing access to the best technology in the world and supporting effective technology use. We want organizations to do a better job with the resources they have, better execute on their goals, nurture deep connections to peer organizations and to the communities they serve. To that end, our portfolio outcomes are effectiveness, efficiency, community connection and innovation. We have learned that 89% of our customers are, in fact, becoming more effective at achieving their missions! We’re also seeing our customers connecting to peer organizations through our Power of Us Hub. In addition, the majority of our customers agree that Salesforce.org delivers innovations to meet their needs. Event attendees learn about Pencils of Promise’s work in virtual reality. Our investments in Future Ready Leaders are driven toward creating and supporting an inclusive and diverse workforce with the skills to thrive in the 21st century. We want youth all over the world to be School Ready, Tech Ready and Workforce Ready and our outcomes reflect this. For youth to be School Ready, we need family safety and effective educators. We funded the work of Hamilton Families, which placed 182 San Francisco families experiencing homelessness into permanent housing last year. For students to be Tech Ready, they need to show academic interest, improve their academic performance, and get to college. Through our work with both the San Francisco Unified and Oakland Unified School Districts, we’re seeing more students enrolling in computer science courses and actually doing well in them! We’re also seeing Algebra I repeat rates in San Francisco drop by 50%. To determine if our youth are Workforce Ready, we’re looking at job/ post-secondary placement, completion of preparatory programs, job retention, skill gains, and wages. We are seeing 79% of youth completing internship programs we support either getting placed into training-related jobs or enrolling in college. 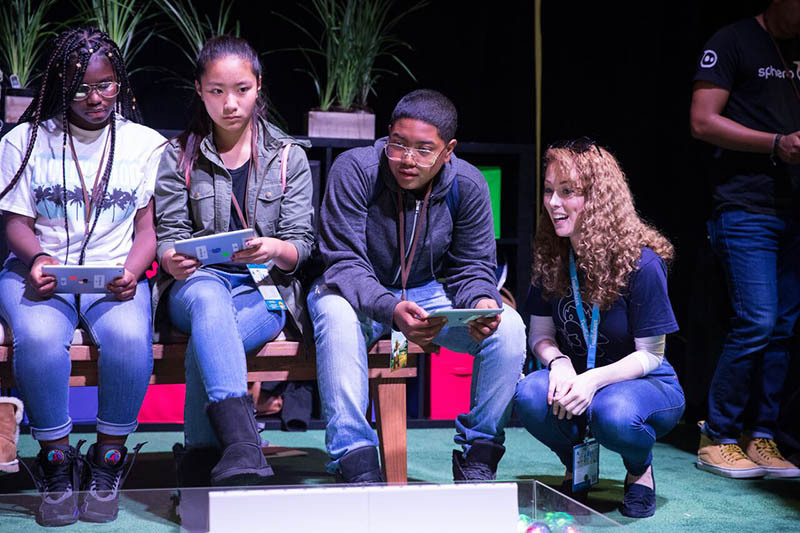 Kids enjoy learning technology skills at a Salesforce event. 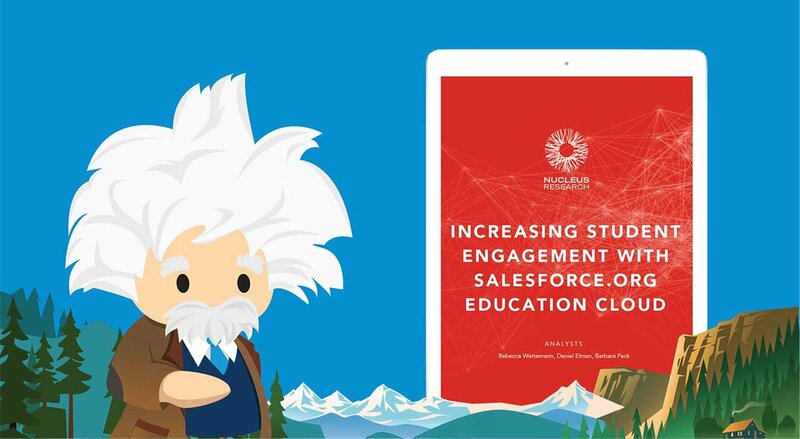 Our community engagement efforts focus on partnering with Salesforce.com to empower its employees to become citizen philanthropists, who empower the workforce of tomorrow, harness professional skills for good, and strengthen the communities they care about. We know that both employees and the organizations they support benefit from giving back. Therefore, our outcomes in this area are focused on citizen philanthropy, employee satisfaction and retention, and organizational improvement. 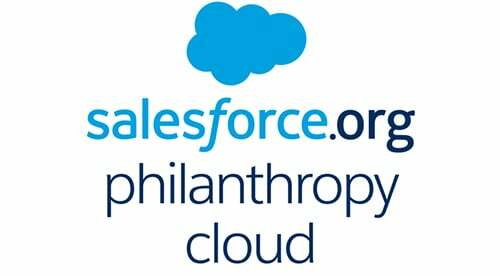 Salesforce employees volunteer and donate at very high rates. We also have a sizable percentage of employees engage in pro bono activities, using their professional skills to help organizations in a variety of ways. A whopping 92% of our employees engaging in pro bono work reported being happier at work! Salesforce employees are engaged with local communities. We will be developing even more powerful ways to share our collective impact story through the SDGs. Stay tuned. The Salesforce.org Social Impact Report 2018 is a milestone in how we think about impact measurement and engagement. However, this is just the first step on our path to impact. We are driven by the belief that technology, when used for good, can change the world. Our reporting will evolve as we continue on our journey. We intend to publish this impact report annually. As we continue to refine and test our approach, our framework and our processes, our impact measurement program will continue to mature and improve. The data in this report draws from a variety of different sources including the 2017 Voice of the Customer Survey, 2017 Employee Satisfaction Survey, internal Salesforce.org data on staff volunteering and donation, and 2017 grantee reports. Your impact is our mission. We best advance our impact – and that of the social impact community – by helping one another to focus on outcomes. Our community has the opportunity to help restore trust in a fractured world by leading with impact, aligning on the goals (outcomes), and collaborating to achieve them together. 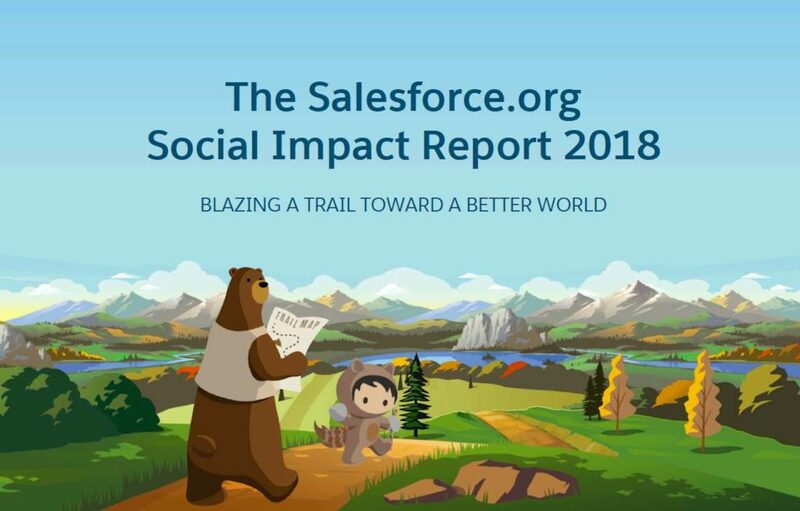 NOTE: The Salesforce.org Social Impact Report addresses impact associated with Salesforce.org, a nonprofit social enterprise. Individuals interested in the Salesforce.com Stakeholder Impact Report can find it here.